Killer Characters: You're invited to a wedding with the Seaside Knitters! You're invited to a wedding with the Seaside Knitters! Little did I imagine forty years ago the twists and turns my life would take. Back then, my days were filled with college classes, volunteering for Greenpeace, long walks around Harvard Square with my graduate friend, Ben. We’d talk for hours, Ben and I—about life, politics, about the environment, women’s rights, a war being waged on the other side of the world. And we’d plot and plan and dream with the boundless energy of youth. Graduation thrust us both into our Boston careers—and into a relationship that morphed into love when we were least expecting it. Conversations took a turn, too, now revolving around weddings and babies, balancing jobs and a life together, and moving into our Beacon Hill townhouse. Those lovely years went by in the blink of an eye. So many joys—with a few sorrows sprinkled in. The days are wrapped up in memory now but pulled out often as family and friends visit us in the seaside town Ben and I have made our home in semi-retirement. It was a full and generous life, even though the babies didn’t happen for Ben and me. But though the babies didn’t come, someone else did. And we welcomed her directly into our lives and hearts. Izzy came, that’s who. My sister’s child, my favorite, if aunts are allowed to admit as much. In a turn of fate as crazy as it is wonderful, Izzy abandoned a Boston law career and opened up a yarn shop on Harbor Road, just down the hill from our home. The Seaside Yarn Studio. And that’s where you can find us each Thursday night--Izzy, Cass, Birdie and I. It’s where we toast our triumphs and unburden our souls. It’s where we knit up hats for the fishermen, sweaters for friends, and knit squares for charity. It’s where we explore the lives of our friends and neighbors as we knit and purl. And this spring, while we chat and sip Birdie’s fine wine, we’re creating the most magnificent garment of all--a shawl woven of cashmere and friendship. Izzy said yes to Sam, just as we all hoped she would do. And as the crocuses peek out from beneath the melting snow, the wedding shawl is growing into a glorious swirl that heralds the impending wedding day. And along with it grows our determination to make the June wedding day a perfect one. A day nothing will spoil. Not the cold case discussed at Izzy’s book club. Nor the mysterious gardener bringing my backyard back to life. Nor the wedding planner who has missed several meetings with Izzy and me. Nor the rumors that ride the ocean breezes through the windows of M.J.’s beauty salon. Nothing can spoil Izzy’s day …. I love the cover of this one and can't wait to dive in and learn more!! This sounds like a terrific book to spend a day in. I hope nothing happens to mar Izzy's wedding day. Now this is a wedding I just can't miss! I'd like to see that wedding shawl too. Thanks for joining us at Killer Characters. Sounds like things are very mysterious in your world. Really looking forward to the wedding, and in such an exquisite setting! That cover is definitely frame-worthy. Izzy will look gorgeous in the wedding shawl created with so much love and friendship by the Thursday night group. Great cover! Something tells me something bad is going to happen. I hope Izzy's wedding works out anyway. Thanks for coming to Killer Characters. It all sounds ideal...or does it? 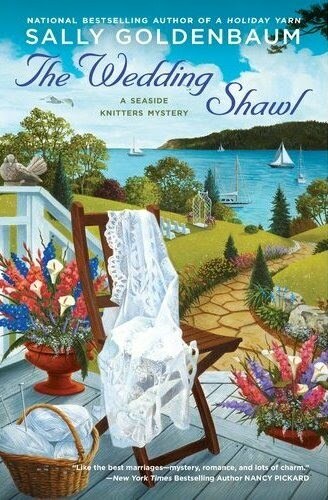 I can't wait to read all about it and the beautiful wedding shawl. What a caring and loving community for Izzy. I wish her luck and happiness. Love the cover. I hope nothing mars her wedding. Thanks to all of you who stopped by! And for the warm welcome. The wedding shawl is really wonderful...now if I can only get someone to knit it. It was inspired by one designed by a grad student in North Carolina who is super talented--and generous to let me reprint it. Thanks again everyone--see you at the wedding....!